Journey to higher altitudes of Yellowstone National Park in the United States and watch the steam rise above the colorful, bubbling hot springs. A fascinating tourist attraction that was created by many variations of forces of nature that has taken place over the years. The temperature of the Hot Springs can sometimes be over 400 degrees farenheit, definitely too warm for a dip but extremely interesting to see. 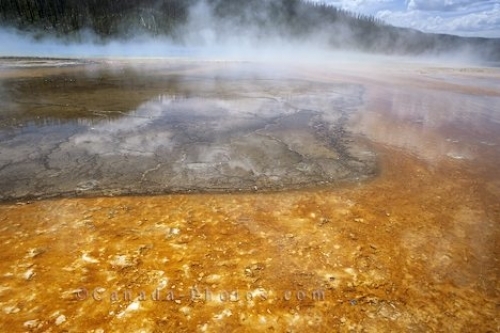 Picture of hot steam above the surface of the golden colored hot springs in Yellowstone National Park in the United States.